For any given project, strong collaboration is often the key to success. 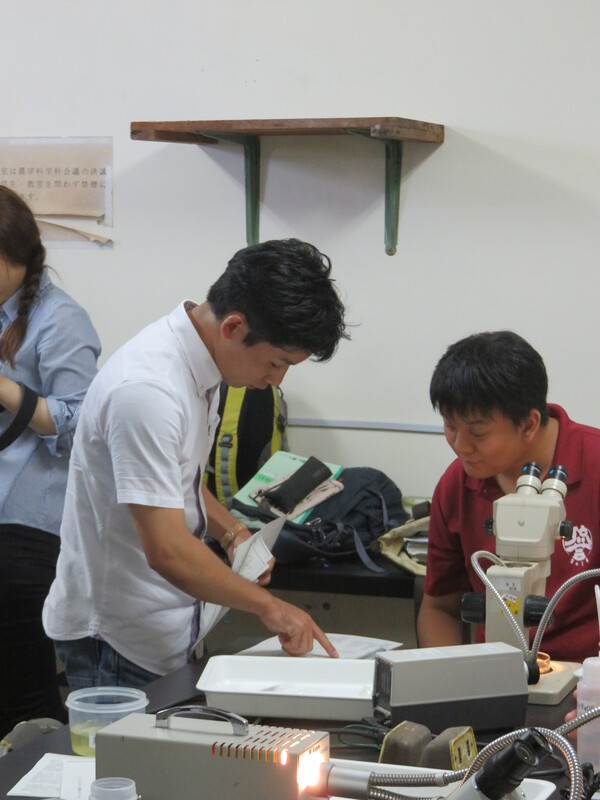 An important collaboration partner for the OKEON Chura-mori project is the University of the Ryukyus (Ryudai). 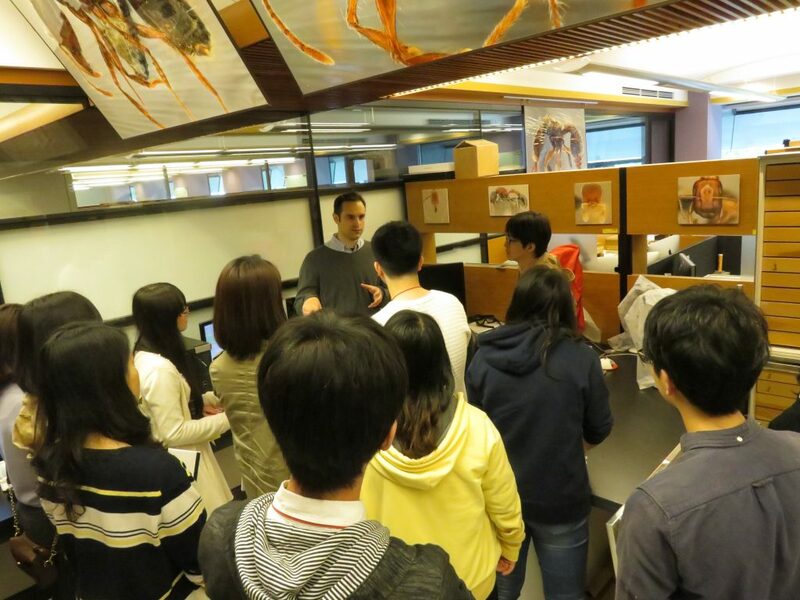 The Economo Unit at OIST hosts bi-annual joint lab meetings with their counterpart at Ryudai. These meetings have been great for establishing joint interests and combining specialist skills to conduct research. Currently, the two labs are planning a joint research grant application. 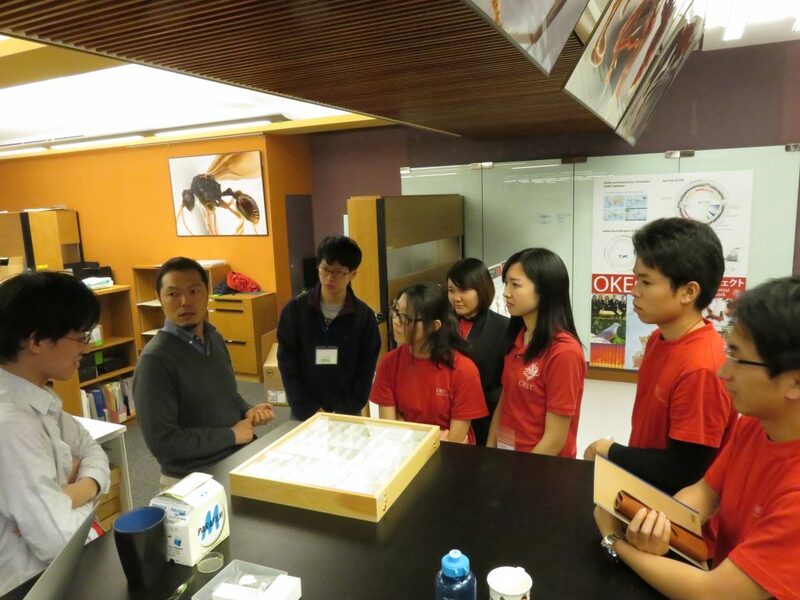 Professor Tsuji, Professor Tatsuta and their lab have been instrumental in the process of setting up and progressing OKEON, providing advice and connections to their well-established network across Okinawa and Japan. The field centre at Ryudai has also provided permission to set up a monitoring site on their land. What has been a challenge, however, has been involving students from Ryudai in the collaboration. 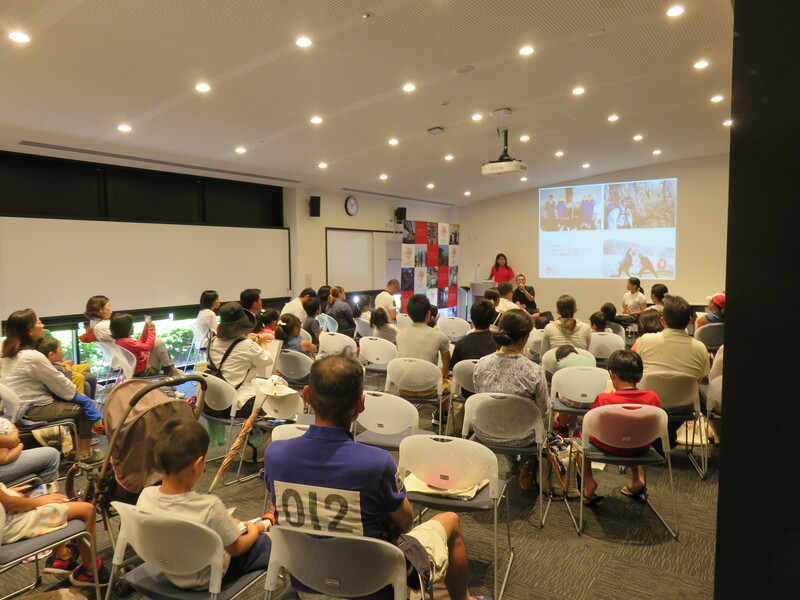 Ryudai students appear to not only be intimidated by conducting research solely in English, but also the image of OIST as a global research university with unattainably high standards. Inviting students to the lab meetings was not enough to break down these barriers, real and perceived. 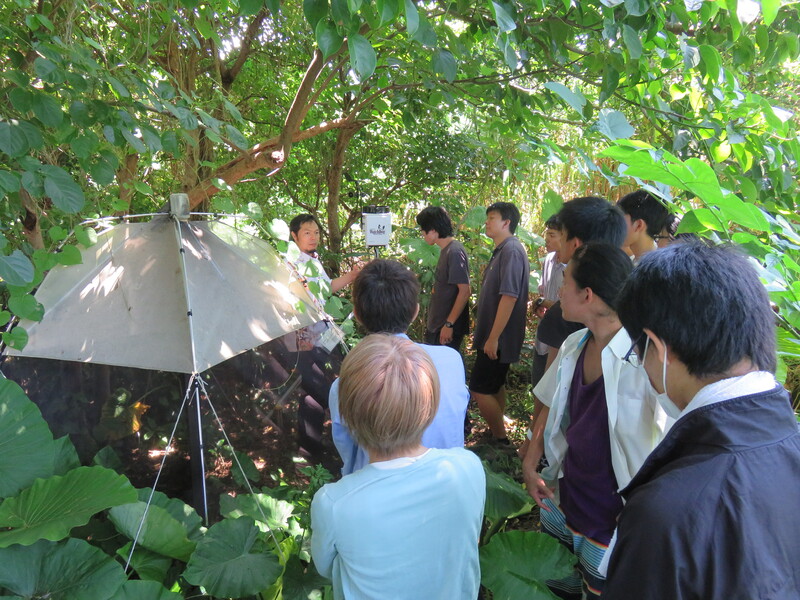 To improve collaboration and ensure that benefits are reciprocal, OKEON and Professor Tatsuta, a lecturer in the Agriculture Department at Ryudai planned two field class sessions in July 2016 in which third-year students would be introduced to the OKEON project and learn basic sampling and species identification skills. 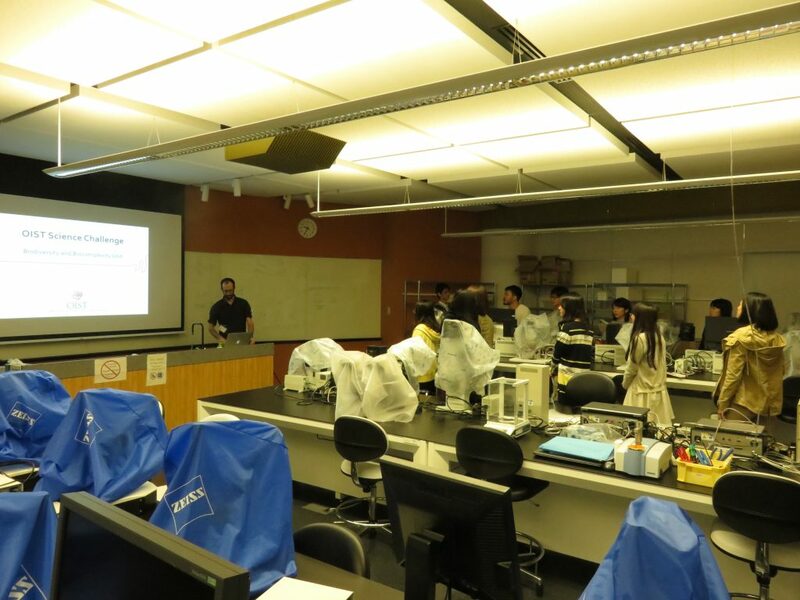 The first class was introduced by Dr. Yoshimura, who explained the project from a scientific perspective. 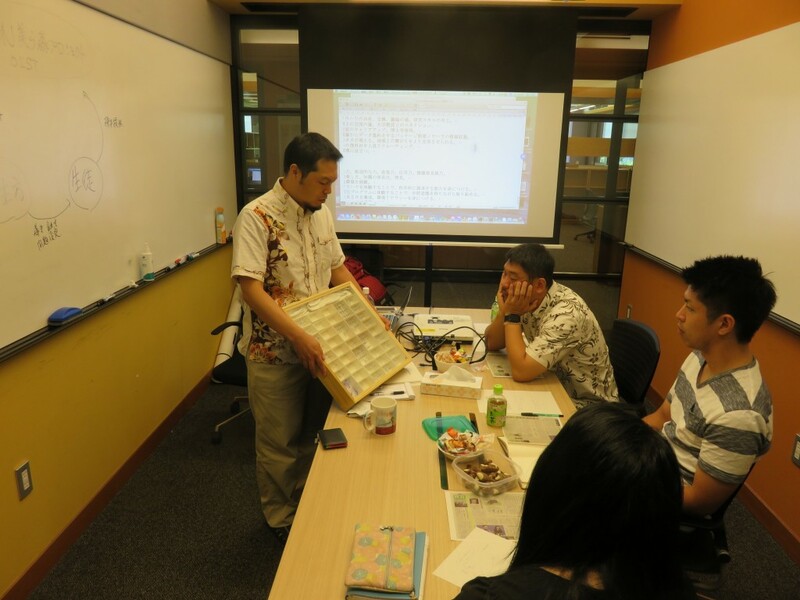 Then, under the supervision of Mr. Yoshida, our insect specialist, Mr. Kinjo and Mr. Iriyama, two members of the sorting team gave a lesson in sorting insects. OKEON’s sorting team is made up of six members, who are hired locally and had no prior experience or specialism of working with insects or research. The following week, students were taken into the field itself and took part in the sample collection process, before sketching a sample they had sorted the previous week. Two major achievements were made through these classes. Firstly, by tailoring the class to university students, and conducting it in Japanese, students were engaged throughout and reacted positively to the idea of using data from OKEON for their graduate theses the following year. Visiting the trap in reality, and experiencing data collection and fieldwork made the research more accessible, and perhaps more interesting. 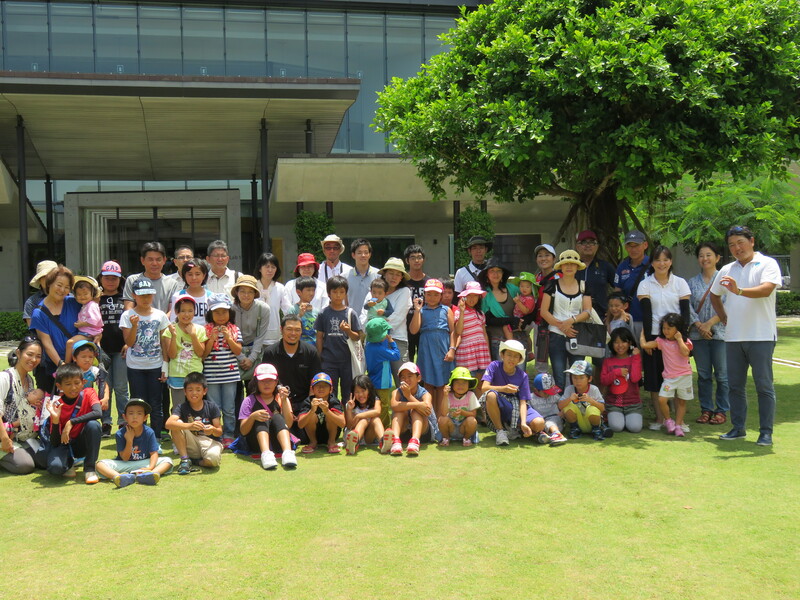 The second positive achievement was how Mr. Kinjo and Mr. Iriyama conducted the sorting class. Having the specialist knowledge and confidence in their ability to teach university students is a testament to their hard work and demonstrates their progression and development. The sorter training programme aims to not only teach specialist environmental knowledge, but to develop responsibility, communication skills, and other skills which will be useful in any career path. 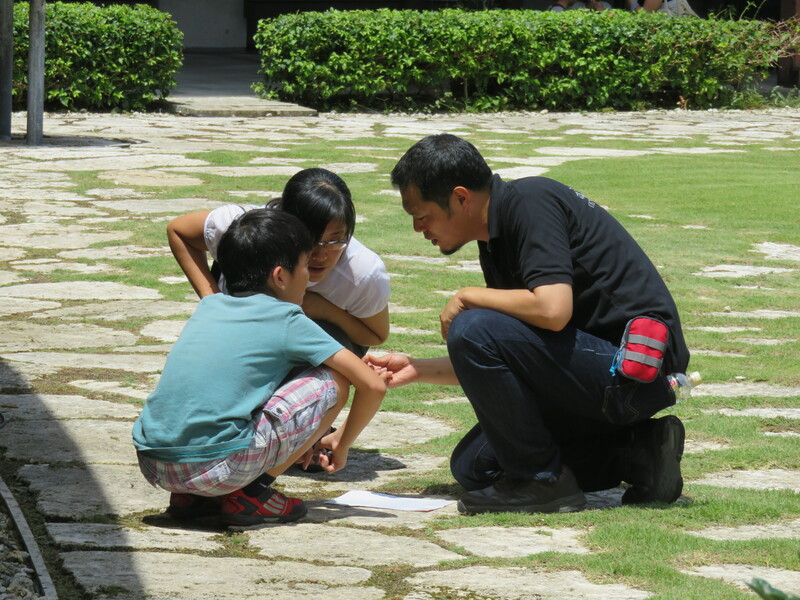 Instructing university students shows their ability to contribute to society academically as well as strengthening the bridge between OIST, Ryudai and Okinawa’s local community. 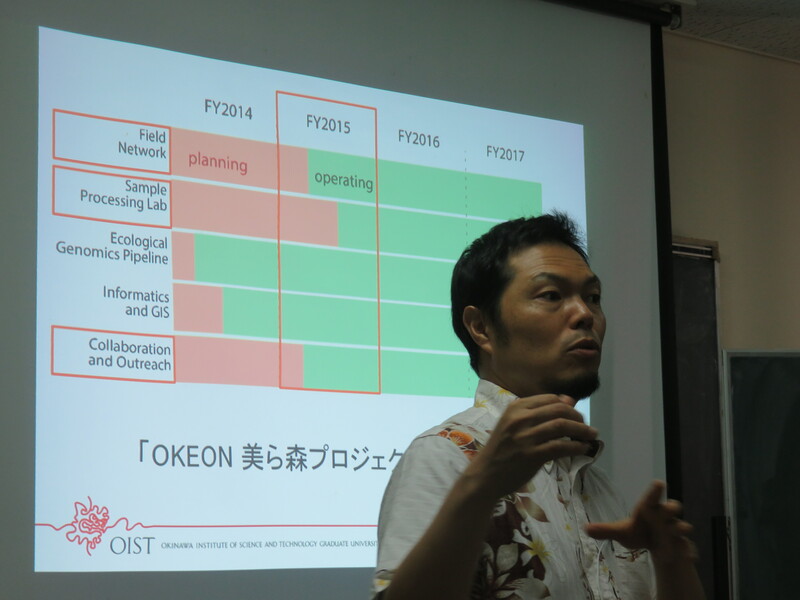 In terms of OKEON and OIST, one benefit is having access to more potential students to conduct research using the large volumes of data generated by OKEON. Another is the possibility to explore different ways of collaborating across academic institutions and within society via research. 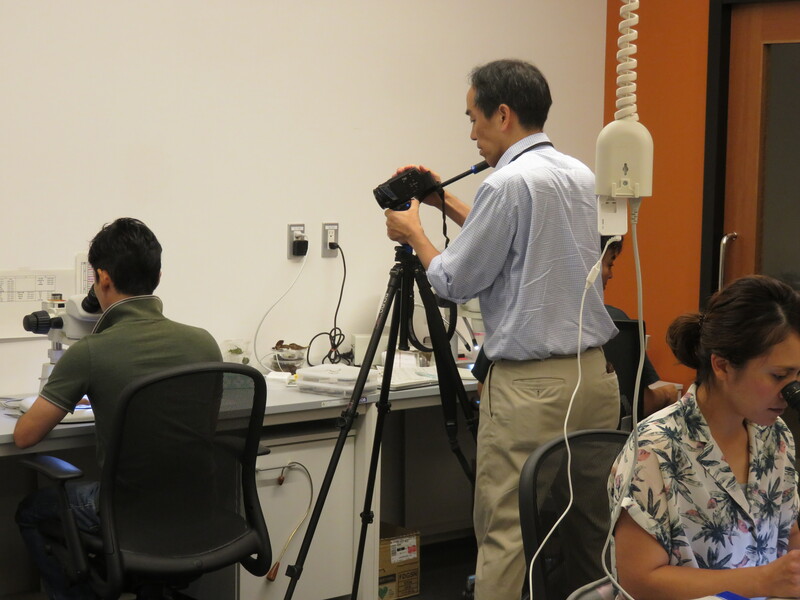 This type of collaboration is currently a topic of particular interest, and in fact, JST (Japan Science and Technology Agency) took an interest in the programme and came to film the first class for a documentary on Citizen Science. 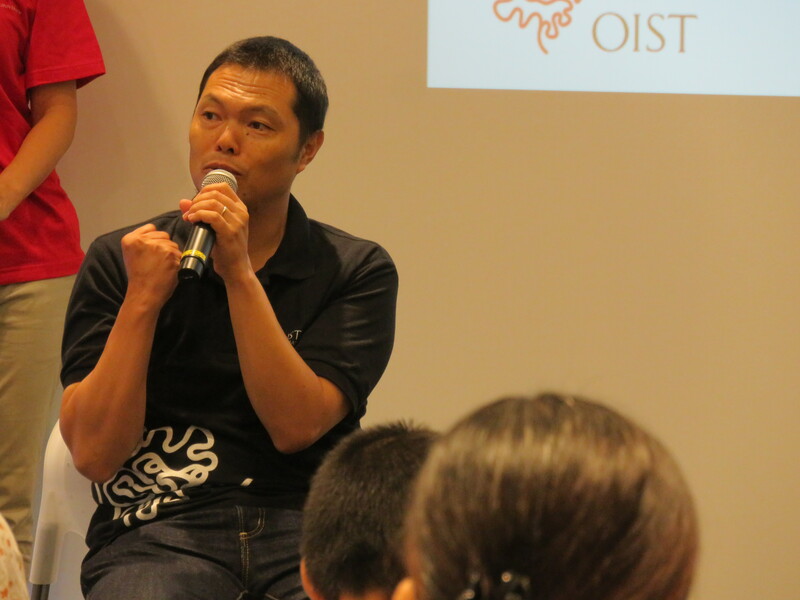 While there is already a strong partnership between Ryudai and OIST, it can still be developed further. These classes were an important step towards expanding the collaboration to include students, and the sorting team. 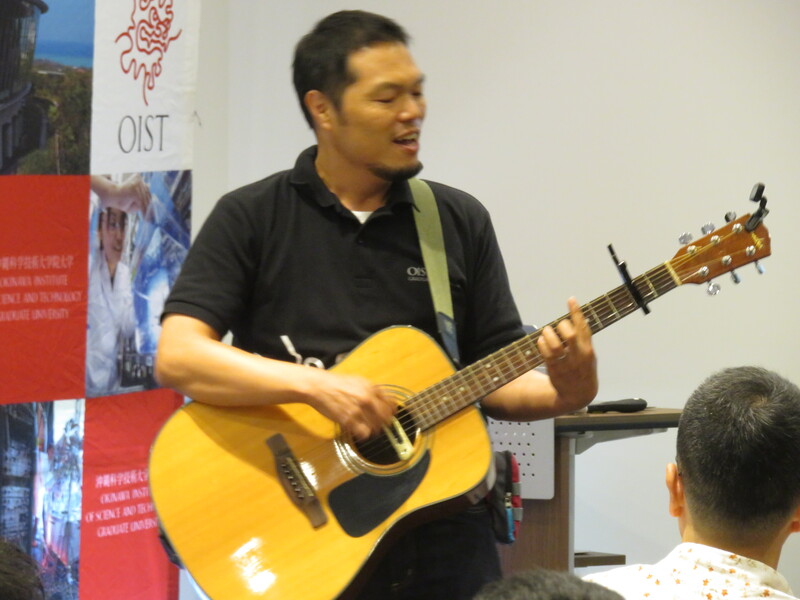 More links does not necessarily mean that there is greater collaboration, but in this case, a diversity of approaches has been beneficial and may result in further joint efforts between OIST and Ryudai. 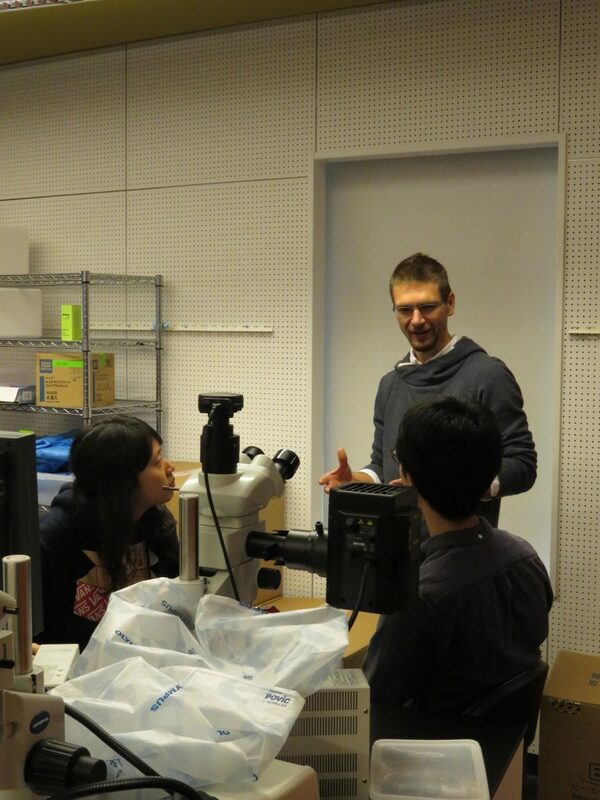 To see what else is going on at Ryudai in the Tsuji Lab, please click here. For more information and links to the Ryukyu Shinpo Column please click here and here. 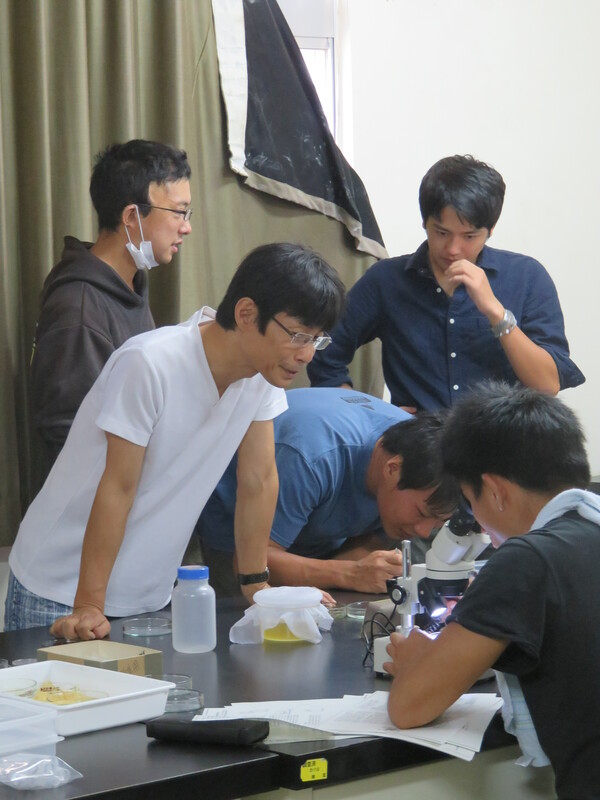 Okinawa Integrative Biology Course underway now! I am pleased to say OIBC is underway at Seaside house. We’ve got an exciting lineup of speakers and a great group of students all to think and learn about “Big Data in Biology”. Please check out the website and if you are in Okinawa, come to the lectures.